China is big, and that is no secret. However, if you have some time to spare, definitely take a vacation in a favorite city or province, if you have one. The Diostar Dumplings team fell head over heels in love with Shanghai. A simple post and a collection of photos do very little justice to describing this majestic, sprawling *city upon a lake*. Shanghai is said to be the world’s most-populous city, possibly taking Tokyo’s spot in the ranks, at this point. Unlike Tokyo, it feels slightly more budget-friendly. Shanghai, the spectacular port city is one of the world’s most renowned trade ports and most cosmopolitan locations. It is said to boast a sizeable French population, as well as palpable signs of a strong presence from British and German settlers. (The latter is seen in the architectural style.) Speaking of architecture, Shanghai has some of the most impressive skyscrapers with innovative designs and colors. (One pink high-rise particularly stood out.) These giants are signs of cultural and economic advancement that continue to propel China towards cementing its status as a global superpower. Everyone’s a Fitness Guru in Shanghai! Say you’ve got a few weeks in China, either as a business trip or a vacation. Diostar Dumplings had a working vacation, this time around. We explored every nook and cranny of Shanghai, both by foot and by public transport. The city’s walk score is a staggering 97 percent– a walker’s paradise, indeed! Feel free to go ahead and cancel your gym memberships now, because all of Shanghai is your gym! Hills, stairways, chiseled-out pedestrian walkways, and a stellar metro system are just what the doctor ordered. In case you are feeling lazy (a nearly-impossible sensation to have in Shanghai), or if your intended address is out of the way, hitch a taxi! Shanghainese cabs are extremely cheap (CNY20-CNY30 / USD $3.08 – $4.63, on average); they even beat out Uber in terms of convenience and cost-efficiency. Don’t Be Shy in Shanghai: Just Speak! Make sure to have your passport at all times: Not only is it necessary for validating your stay in China, it also makes booking tickets and hotel reservations ten times easier. All you need is to show your passport at any train station in Shanghai, and the staff will point out the appropriate track and help with securing a seat. Do not be discouraged, if your Mandarin is not perfect, and definitely do not get hung up on which accent or dialect is fit for which city: Your effort is what counts, and virtually everyone in Shanghai had a voice-to-text translation app. It is somewhat similar to Baidu Translate (China’s version of Google) but works even faster. If you are flying to Shanghai from the east coast, then you can catch Air China from JFK Airport in Jamaica, Queens, New York (as I did in 2015); likewise, you can go from Newark Liberty (EWR) via United Airlines, as I had done during the 2017 trip. My China adventures began in Beijing, so I opted to commute to Shanghai via the 8-hour scenic route on the Maglev high-speed rail (高铁). Book your ticket either the popular Ctrip(TM) app; the app is extremely easy to use and will really come in handy for booking future flights, train routes, and hotels (especially if you plan on an extended stay in China or relocating there, indefinitely). Ctrip is the Booking.com of China. As for the train, it has everything from standing-room-only (not for eight hours, thank you!) to the deluxe sleeper. Check out flight and bookings at www.ctrip.com. I opted for a first-class ticket, which is not as pricey as it sounds: A mere CNY 933.00 / USD $105.00 is worth it if you have the time and desire to take a more scenic route to Shanghai than catching a quicker, albeit more expensive, flight. If you need help selecting a seat for your journey, https://www.travelchinaguide.com/china-trains/high-speed/seats.htm ought to help. Take a Hike… You’ll Love It! Choosing the right hotel in Shanghai goes beyond *location, location, location*. Your home away from home may be situated right in the center of Shanghai’s prime attractions and within walking distance to the metro and/or bus stop, but there is a catch: You may be the only non-Chinese individual or group staying there, and the government may discourage these establishments from letting you in. Yes, they definitely play the *waiguoren* (foreigner) card rather liberally. You can still fit in, either as an expat or traveler, in hotels that are off the typical tourist trail. Doing a bit of reconnaissance helps you make sure that the room is not only conveniently located but is also clean, safe (an easy find in Shanghai! ), and within your budget. Having even the most basic understanding of Mandarin will get you further than expected, and the hotel staff will gladly chime in with a voice-to-text translation app. Free up a couple of hours, while in Shanghai, to do some recon of the hotel(s) you have considered. As we said, the inside of where you will be staying (cleanliness, amenities, staff) matter as much as does the location, if not more so. We at Diostar Dumplings were fortunate to have chanced upon three such hotels: the Campanile in Shanghai’s former French concession on South Suzhou Rd（南苏州路), the posh Bund Riverside Hotel on East Beijing Rd (北京东路), and the budget-friendly Han Ting Express on No.465 East Jinling Rd,（金陵东路 ); all are in the center of Shanghai’s famous Huangpu District (黄浦区). The Campanile is a quaint, modern boutique hotel with a French aesthetic. Signs welcome you in Mandarin, French, and English. The staff takes a while to warm up to, especially if you are a waiguoren guest; however, trying out your Mandarin will always pay off. The best part of Campanile was Jerry, the general manager. While the staff seemed standoffish, Jerry took upon himself to accommodate his guest’s needs and concerns. 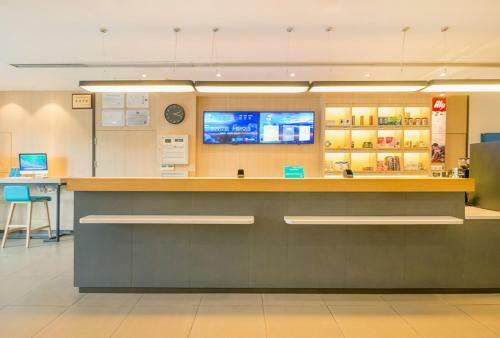 The hotel is stunning and clean with a 24-hour vending machine that sells not only snacks but also emergency hygiene and beauty products.The is close to Shanghai’s famed People’s Park and several outdoor propaganda poster galleries. However, the nearest stores and restaurants are at least fifteen minutes away by foot; finding the metro station is tricky, as well. Campanile near the Natural History Museum is ideal as a secluded retreat for families with cars, of which I saw quite a few in the driveway. Rooms average to approximately CNY285.30 / USD43.00 per night and are strictly non-smoking. However, a guest or two managed to break the rules and set off an honest-to-goodness siren in the middle of the night; the staff immediately ordered everyone to evacuate (! ), although I calmly remained in my room. Jerry, the fabulous general manager, promised to rectify the issue immediately, as I informed him of my intention to switch hotels. He went so far as to contact several hotels that were more pedestrian-friendly, in addition to refunding the rates of the days I had remaining. (Campanile normally adheres to a no-refund policy, but a negligent smoker in a non-smoking hotel is reason enough to demand a full refund, from the check-in date onwards. I shortly ended up at the Bund Riverside Hotel (my home during the 2015 trip). Imagine waking up to the chimes of Shanghai’s breathtaking Bund… As the majestic Fuji-san is visible from virtually anywhere in Japan, the chimes from the Bund riverside echo throughout all of Shanghai. If you stay at the Bund Riverside Hotel, your view will be to die for; plus, the Bund (aka Wai-Tan/ 外滩) is a mere five-minute walk. Saying that you have a vast array of stores, restaurants, and parks within easy reach is an understatement. No photos can suffice to describe the Wai-Tan properly. The staff could tone down their haughtiness down a notch. After all, you are making an earnest effort to communicate your needs in Mandarin. Unlike the Han Ting Express (more on that later) or the newer Campanile, the Riverside Hotel thrives on tourism. Customers come from both from all over China and abroad. Still, the staff is a small bruise on the otherwise-delicious apple that is the Bund: The rooms are fit for royalty, complete with a spacious shower and tub (finally! ); a breakfast nook with complimentary tea, coffee, and cookies; as well as a mini-fridge full of snacks and a minibar, on which you can splurge, if so inclined. (The cost will come out of your CNY 700.00 /USD $105.43 deposit, which you pay upon check-in.) The hotel also has a cute bar lounge, where you can sip a pijiu (beer) or a cocktail to the tune of smooth jazz. Since we were staying in Shanghai longer than originally planned, we thought about giving our wallet some breathing room and book the Hanting Express. Some guests might feel disconcerted that the staff speaks a little to no English. However, it was a plus in my book: It served as a fantastic incentive to get my Mandarin skills up to par. While certain points were difficult to get across, the staff and I were able to communicate quite well, sometimes on our own and sometimes with the help of their translator app. Once the language discrepancies are under control, everyone is clearly helpful and working hard to accommodate every guest’s needs. Certain hotels in China are bound by the government to accept only certain types of people as their patrons. Basically, no waiguoren (foreigners) allowed. But Hanting Express is a different story: While I was their only non-Chinese guest, they graciously accepted me (and my RMB); they went so far as to put my larger suitcase in storage, while I took a weekend trip to nearby Suzhou, and upgrade me to a room with a better view, upon my return, at no extra charge. Given its location, the hotel is truly a steal: a mere CNY 285.90 / USD $43.00 per night. Sure, everybody knows about the majestic Bund riverside, People’s Square, and the Shanghai Museum. No visit here would feel complete without setting foot in these places at least once. We at Diostar Dumplings were fortunate enough to have these destinations, among others, within walking distance from both the Bund Riverside Hotel and later, from Han Ting Express. Campanile was a bit of a stretch, given its rather gated location. No place in Shanghai feels like a tourist trap, not even Shanghai Disney, although the throngs of people waiting in line were a bit much. We heard that some visitors had to wait as long as two hours to get in, and frankly, we were not in the mood to relive the experience at Chicago Sears Tower (a.k.a. the Willis Tower). Joking aside, not a single spot in Shanghai feels like a tourist trap. Let’s explore, shall we? The Bund, known as wai tan in Mandarin (literally “outer beach”), is virtually synonymous with Shanghai. The term “Bund”, itself, derives from the Farsi word band, meaning a quay or embankment. Bunds are common throughout East Asia, another notable location being the Yokohama Bund in Japan. Vast yet easy to navigate, the Bund is continually bustling with people but rarely if ever, feel overcrowded. Keep an eye on your belongings, they say; pickpockets are rampant, they say. This is often the case with any tourist area, but Shanghai, as a whole, consistently felt safe, even after sundown. The famed waterfront runs along the western bank of the Huangpu River and faces the Lujiazui skyscrapers. Almost all of Shanghai’s architectural eye candy, especially on the Bund, comes courtesy of German influences. Shanghai is also famous as a trading and diplomatic hub, particularly the site of British and Russian consulates. One of Shanghai’s most famous neighborhoods is the historic Quai Francaise (the French Concession), which is dotted with both local propaganda posters and French-inspired artworks. TheCampanile Hotel is a double dose of Parisian elegance, one hotel is situated near the Bund on Nanfujian Lu (South Fujian Rd), while the other is on Beijing Dong Lu (East Beijing Rd). The Bund is never boring. Weekday or weekend, day or night, Shanghai and the Bund never seem to slow down, much like Manhattan, and while you can walk around in peace, the occasional haggler will try to tempt you, either with Gucci Gucci Prada or a Folex… not as obnoxiously as in NYC or Hong Kong, thank goodness. The Oriental Pearl Tower is the famed TV tower located in Pudong Park within Shanghai’s Lujizui skyscraper complex. Established in 1991 and completed in 1995, the Dongfang Mingzhu is the world’s sixth and China’s second tallest TV and radio tower. A friendly staff recording welcomes visitors in English and Mandarin, as they travel 1/4 miles up to the myriad attractions. The Dongfang Mingzhu boasts a wide array of activities–notably the Municipal History museum– commerce, entertainment, and dining; the top level boasts the luxurious revolving restaurant, where you can indulge your appetite for high-end cooking and panoramic views of the Wai Tan. The full royal experience at the Dong Fang Mingzhu, with tours and restaurants included, is actually more budget-friendly than you might expect. If you have the time, definitely go for it! Got a Ticket to Ride the Shanghai Ferry. Children below 1 meter (3.3 feet) are admitted for free while those who are between 1 and 1.4 meters (3.3 and 4.6 feet) enjoy 50 percent discount. We shall definitely scout out the Dongfang Mingzhu in greater detail on our next visit to Shanghai. In the meantime, the Shanghai ferry was calling us to cruise the Huangpu River. The Shanghai Ferry is an extensive system of ferry routes across the Huangpu River, as well as one of the busiest in the world. The municipal authorities established the ferry system in the 1970’s, and by the 1980’s, the number of local and tourist passengers skyrocketed. 18 ferry lines currently provide services across the Huangpu River. You can catch either a standard ferry (CNY 150.00 /USD23.11), as we did or an air-conditioned one (CNY 200.00 / USD $30.81). The latter is a fantastic idea for the steamy Shanghainese summers, but the former will do just fine in January! People’s Square is both a political hub and popular hangout spot in Shanghai’s Huangpu District. Located south of Nanjing Road, People’s Square houses Shanghai’s municipal government headquarters building and is used as a standard point for measuring distance in and around the Shanghai municipality. Before the People’s Republic of China formed in 1949, People’s Square belonged to the Shanghai Racing Club and their prized horses. The government quickly banned racing and gambling, marking an era of transformation for the People’s Square. A number of popular attractions became part of the People’s Square, including People’s Park, the Shanghai Museum, the Shanghai Grand Theatre, Shimao International Plaza, and Tomorrow Square. The Shanghai Museum houses an extensive collection of ancient Chinese art. Founded in 1952 and rebuilt in 1996, the Shanghai Museum comprises a part of the People’s Square at the site of the former Shanghai Racehorse Club. The museum had acquired its prized pieces from collections of privately owned artworks and artifacts, which both the Communist government and customs service had wrongfully confiscated during the civil war. Private and institutional collectors continued to contribute to the rapidly-expanding museum, notably the Royal Asiatic Society. The Shanghai Museum includes the following galleries: Ancient Chinese Bronze, Sculpture, Ceramics, Jades, Paintings, Calligraphy, Seals, Numismatics, Furniture of the Ming and Qing Dynasties, and last but not least, Arts and Crafts by Chinese Minorities. General admission is free of charge, while prices for special exhibits vary. The Temple of the City Gods, as the site is also known, commemorates the elevation of Shanghai from a city to a municipality. According to folk legend, the City God Temple is the home of three deities, who helped Shanghai reach its height as a prominent beacon of trade. Currently, the name Chenghongsimiaorefers not only to the temple but also to the commercial district near the temple. Tourists and expatriates from English-speaking countries may recognize it as Yu Garden. Originally dedicated to the spirit of Jinshan (Gold Mountain), the City God Temple soared in popularity in 1403 during the Yongle era of the Ming Dynasty. The Qing Dynasty saw an influx of devotees and tourists, who flocked to the temple to pray for good fortune. It soon became a bustling marketplace specializing in local handicrafts and later for imported merchandise. The Cultural Revolution put worship on pause, as the temple became a jewelry shop until 1951 when the Board of Trustees of the City God Temple dissolved; the Shanghai Taoist Association has since turned it into a Taoist center. Chenghuangmiao is the ideal place to meditate and simply decompress. Even though it ranks as a must-see travel destination, not a single tourist was in sight. Long before Jerusalem and New York City opened their doors to survivors of World War II, Shanghai became the modern-day Promised Land for Jewish refugees. The Tianqiao historic area of Shanghai’s Hongkou District is home to the Shanghai Jewish Refugee Museum, formerly the Ohel Moshe Synagogue. The Hangkou District, itself, was home to a thriving Jewish community since the 19th century. During the 1930’s Nazi Germany encouraged German and Austrian Jews to emigrate. Most European nations have closed their border; whereas Shanghai and the Dominican Republic let them in; also, settling in Shanghai did not require a visa, at the time. In 1907, Moshe Greenberg had established a synagogue for fellow Russian immigrants. The Ohel Moshe Synagogue became a psychiatric hospital, soon after the Communist government confiscated it in 1949. It reopened in 1990, and the Hangkou government restored the synagogue’s original design, based on the drawings found in the municipal archives. in 2014, the Shanghai Jewish Refugees Museum unveiled a monument by celebrated artist He Ning. The structure commemorates more than 13000 names. Dr. Ho Fenng Shan, Chinese Consul General in Vienna, issued “visas for life” to thousands of Jews in Shanghai. Want to feel like a kid in the candy store? Shanghai has got you covered with its abundance of stores. Then, there is Shanghai Disney. The lines are exceptionally long, so we decided to skip it, this time around. Among the many excuses to revisit Shanghai, again and again, Disney is a good one, at any age. Have fun strolling around The Hub, a colossal shopping complex in the Minhang District. Part of the Xintiandi Corporation, the Hub incorporates the North Mall and the South Mall. The former consists of showrooms, while the latter is made up of both regional and international outlets, selling everything from Louis, Gucci, and Prada to mouthwatering snacks and meals that will put any US food court to shame. Exquisitely crafted silk cheongsam (traditional body-hugging gowns). Cover yourself in Shanghainese couture at the Rain Box! Foodie or not, you’re going to love Shanghai! Its cuisine is absolutely spine-tinglingly, mouth-watering! You can hop on the tourist trail and look for the city’s trendiest restaurants. But really, the more local and down-home the dish is, the better it tastes. Don’t be afraid to step off the beaten path for a bit. Simply walk around, and pop your head into the first local spot you see. A delightful array of stews, stir-fries, and braised dishes will be in store, every time you dine or snack in Shanghai. The palette of the palate encompasses much more than rice and noodles; not a single noodle dish is like the other, either. Food Court? Not Even Close! Lunch at The Hub (a mall complex on East Nanjing Rd), Braised Chicken with chilies and Shanghai bokchoy. Suzhou-style Egg-drop Soup with seaweed is a fantastic dish that is both filling and light. Perfect for breakfast or lunch, it cost a mere (CNY15.00 / USD $2.31) Steamed Bamboo (a slight noodle like texture), sliced ham, and sweet peas in a light broth. This dish is a great accompaniment to the egg-drop soup (CNY10,00 / USD $1.54). Mmm…Duck Noodle Soup for lunch! Another delectable gem from the Hub on East Nanjing Rd, this bowl of goodness includes the delightful cellophane noodles, slices of boiled duckmeat, duck blood cake, silk tofu, and cilantro. Blood cake, by the way, is a national delicacy. (Think blood sausage but creamier and without the casing or extra spices). A close-up of the cellophane noodles… yum! Food Groups have never Looked Better! Another local hangout on Nanjing Road serves an unbelievably delicious, Sweet ‘n’Spicy Braised Fish with the popular Szechuan chilis, edamame, and shitake mushrooms. A savory steamed egg custard is the perfect counterpoint to the explosion of flavors with its subtly silky texture and a mild taste, served with rice. Tasty Breaded Fish with oyster sauce and the peanut sauce was an excellent detour from the usual, yet no less tasty fare of noodle soups and chicken stews. The soft texture and mild flavor of the tilapia went extremely well with the crunchy coating of panko breadcrumbs. The contrasting flavors of the sweet-and-salty hoisin with the umami of the peanut sauce were right on point. Fluffy Xiaolongbao (steamed buns version) and Nanxiang-style pork soup dumplings at the Bund Visitor Center in Shanghai were a perfect snack. I don’t usually eat pork, but when I do, it’s in the form of Shanghai soup dumplings! Nanzhou-style hand-drawn noodles with minced Yangcheng Lake crab and cilantro is great anytime, winter or summer, lunch or dinner. If you are in Shanghai and looking for a change of pace, then definitely check out Suzhou. It is a major economic center in southern China and the largest city in Jiangsu Province. The city is famous for its breathtaking, calming scenery and winding canals. People often describe Suzhou as the Venice of the East, but in fact, it is the other way around. The former dates back to 514 BCE, so Marco Polo, reportedly enamored with China, probably gave Venetians a hint or two about how to build their city. Suzhou is situated in the lower reaches of Yangtze River, approximately northwest of Shanghai. Unlike its bustling neighbor, Suzhou is considerably low-key and quiet. It makes an ideal, resort-like escape; even the nightlife tends to wind down after nine o’clock or so. The best way to make the most of your time in Suzhou is to check the weather forecast and head down on a sunny day because the most beautiful parts of it are in great outdoors. A truly unforgettable experience is the gondola ride, during which you get eye candy from the surroundings and ear candy from the local boatman’s styling in the Suzhou dialect. Suzhou is, without a doubt, one of the most desirable travel destinations. It is the silk capital of the world; locals flock there to get married on 11/11 (National Singles’ Day), and the regional food is slightly more upscale than that in Shanghai. Still, it is all delicious and not a bit pretentious and the food is absolutely amazing! For instance, Mandarin Fish a whole fish coated in crispy rice flakes and cooked in a sweet, stick mandarin orange glaze. Longevity Noodles Soup with tilapia. Roast Duck (CNY 15.00 / USD $2.31), Bean Sprouts in tingly-spicy chili oil (CNY3.00 / USD 0.46), and Winter Melon Soup (CNY5.00 / USD$0.77) is not too shabby a lunch for a train station cafe! Only in Shanghai. I snagged this tasty combo on my way to Suzhou for the weekend. If you have a chance to spend a couple weeks in China, then Shanghai is an absolute must. Imagine the elegance of Paris, the frenetic buzz of New York City, and the safety of Tokyo rolled into one. The end result comes wrapped in a pretty awesome package with a price tag lower than a week spent at either of the aforementioned cities. Surely, it is the type of place you will want to revisit, again and again. Next year in Shanghai!